This is part 1 of an ongoing community project to help people understand how to get jobs during a recession. This data is slightly skewed towards those that are already active in social media as the survey went to those within my network on my blog and the highly connected Twitter community. There were 214 respondents to the survey although this graphic only represents those who got jobs since Sept 2008 (71 respondents) that represent those that were hired during the announcement of the recession. This is a personal research project, and is not tied to my employer, clients, or anyone else for that matter. Most (43%) get their jobs through their immediate online network of friends, colleagues, alumni, or family. 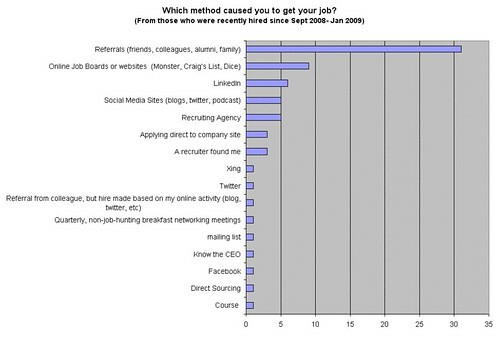 Although a big gap the second (12%) most used method was through online job boards or websites. Some suggested on Twitter that in Europe or Asia this is the primary method of job seeking –unlike the highly wired online job market in US, I did not ask location question to verify. This could also be due to the fact that my network are people already using social media and are hyper-connected to each other. I had no idea this method would have been so high, if it were, I would have asked separate questions to break that out into different referral methods. Job seekers should nurture their relationships with their peers first. They should reach out and connect with their network before they need them.